Great service and overall experience. Food was a little pricey. Wonderful vacation at an excellent property. Staff was amazing. Beautiful view of the beach. Adult pool and fun kids pool. Beautiful pond with coy fish. Just kick back, relax and let the switched-on team at Orbitz help you tailor an extraordinary Kamuela trip. If you're hoping to combine your flight and hotel options to save heaps, you've come to the right place! A perfect way to save is to bundle your bookings. You will save as much as $857* by picking out your preferred airfares, hotels, rental cars and experiences with us. Not just that, but you'll be able to tailor your vacation by selecting from 500 airlines and no less than 500,000 worldwide hotels. You have the flexibility! Pick a package deal that fits in with you and your traveling style. There are limitless possible flight options, room types and awe-inspiring adventures just a click or two away. Life's a bit ordinary without little perks and dollar savings. You'll receive instant Orbucks if you carry on booking with us. This straightforward system lets you gain rewards fast! Want perks, like complimentary breakfast, at all Orbitz Rewards VIP Hotels? Just stay four nights for gold status and 12 nights for platinum status in a year. And how do you redeem? It's a piece of cake! Just make use of your Orbitz Rewards points on the following booking. Getting lost in a foreign country always sounds romantic. But if you want to arrive in Kamuela on time, listen up. This city is approximately 160 miles southeast of Hawaii's capital, Honolulu. Kamuela is also 20 miles northeast of Kailua-Kona. The Pu'ukohola Heiau National Historic Site is a significant local attraction. Be sure to see it before you head home. Study the well-preserved rooms and try to imagine how the inhabitants of Anna Ranch Heritage Center used to live. This house provides its visitors with an unusual insight. After more options? Kahilu Theatre is the home of a broad range of art displays, live music performances and programs. Call in and find out what's on. Nothing compares to exploring somewhere new with your own set of wheels. If you're looking for car rentals in Kamuela, Orbitz is here to help. If you're eager to pick up a car at Waimea-Kohala Airport, you'll need to look further out. There are no rental firms in the area. With only 4 hotels in Kamuela, you ought to get in soon! Orbitz has all you need to secure a decent room. 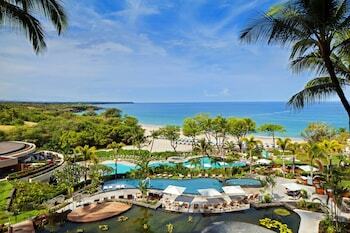 Our top picks for your upcoming island trip are the Wai'ula'ula at Mauna Kea and Paniolo Greens at Waikoloa Village. Consider the services, amenities and facilities, and choose your favorite. After getting all the way to Waimea-Kohala Airport (MUE), you'll just have one more journey to take before you reach your final destination. The terminal is located 4 miles east of the downtown area. Once you've spent some time doing all there is to do in Kamuela, world-renowned attractions are on offer just a stone's throw from here! Tourists from every corner of the globe flock to the Pu'uhonua o Honaunau National Historical Park. You can access it from Honaunau, 45 miles away. Renewed your passport, booked your adventure but now can't go? No sweat — we make canceling simple and straightforward by having a no-fee policy.^ Act promptly and your selected airline and hotel might do the same!